It’s no secret that I recently tried to get on the electric pressure cooker bandwagon–and surprisingly I was not a fan (I was expecting to love it)! 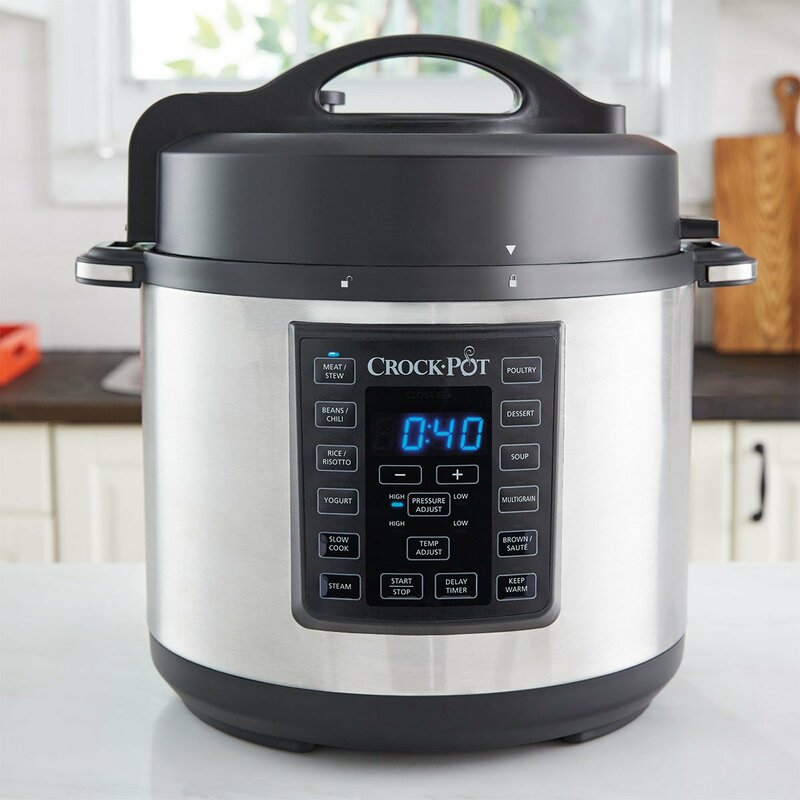 So, I have to say that I was a little skeptical when I was asked if I would try the new Crock-Pot® Express Crock Multi-Cooker (which we are giving away below!) and share my honest opinion for today’s sponsored post*. I absolutely LOVE my Crock-Pot® Slow Cooker, so I decided it was worth giving the pressure cooker one more try using a different brand. For this experiment, I decided to make a recipe that could be made in a slow cooker, but would require some stove top prep cooking first. Cutting out extra dirty dishes is definitely one of the advantages I did see with the electric pressure cooker when I tried it; you can do any sautéing that is required right in the appliance. 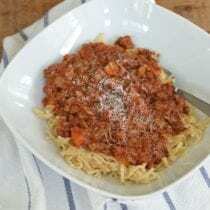 I also picked a recipe that’s typically best cooked for a long period, Bolognese Sauce. Based on my previous experience with pressure cookers, surprisingly, the Crock-Pot® Express Crock was easy to use. I guess a little practice is what it takes with these appliances, but I have to say (and I promise no one is paying me to say this!) half the problems I had before with pressure cookers were a non-issue with this one. And, in addition to being a pressure cooker, it can also steam, slow cook, and brown/sauté foods as well. There were some differences I noticed right away. First of all the insert stayed put instead of spinning all around when I was using the sauté function. Secondly, the recipes that came with the machine were very straightforward. I feel that when you are using a new appliance with a variety of buttons it’s nice when the directions tell you exactly what to push and when with no assumptions! And lastly, I was pleased to see there was a “start button.” Much like you feel the need to hit “save” on a document or “exit” before closing a program, this was something I felt was missing on similar appliances in the past. In the end, the Bolognese Sauce tasted great and only took a fraction of the time. Here’s the recipe for you! Press BROWN/SAUTE, set the temperature to HIGH and then press START/STOP. Add the olive oil and cook the onions, carrots and celery while stirring until they begin to soften, 5 to 8 minutes. Add the pancetta, beef and pork, season with a few shakes of salt and pepper and cook while stirring until brown all the way through, 5 to 8 minutes. Add the wine and cook until reduced by half, 3 to 4 minutes. Add the Italian seasoning, salt and pepper along with both cans of tomatoes. Press START/STOP to turn off the saute function. Secure the lid. Press MEAT/STEW, set pressure to HIGH and adjust the time to 15 minutes. Make sure the STEAM RELEASE VALVE is in the "SEAL" (closed position). Press START/STOP. Once cooking is complete and the pressure is released (either manually or automatically), open the lid. Optional, but recommended: Spoon off some of the liquid and/or turn back on to the BROWN/SAUTE setting to boil off the liquid for a thicker sauce (as pictured). 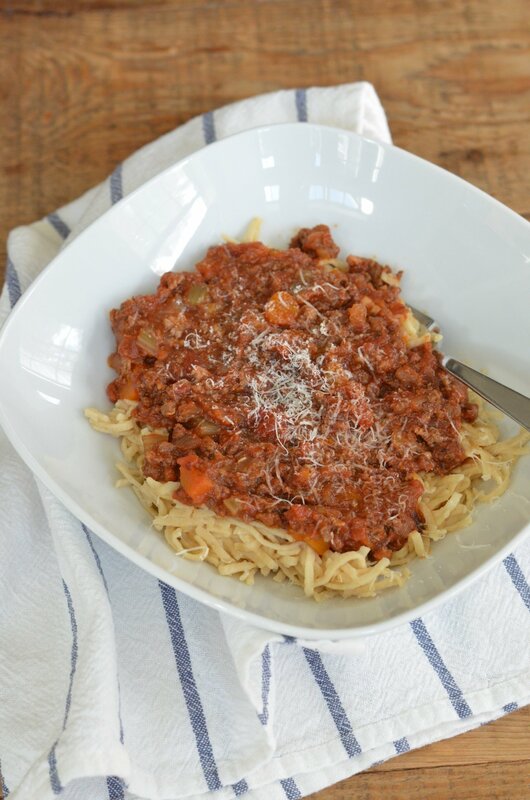 Serve on a bed of cooked whole-wheat noodles topped with freshly grated parmesan cheese. Gluten-free if served over gluten-free noodles. Dairy-free if parmesan cheese topping is omitted. With it’s multi-functionality, the Crock-Pot® Express Crock can be used to make many other recipes as well. Not only does it work as a pressure cooker, but it also can make all of your slow cooker meals, too. This one appliance can actually slow cook, pressure cook, steam, and brown and saute. Having so many ways to use it, the meal ideas are endless. Here is a weekly plan for some inspiration to get you started! Now it’s time to give away a Crock-Pot® Express Crock so you can try it yourself! Enter below and one lucky winner will be chosen and notified by January 5th, 2018 via email (so make sure you use a good email address). *This post is sponsored by the Crock-Pot® Slow Cooker brand, however all opinions are mine alone. Would love to win this as it would be great to be able to have things cooking/prepping while I get other stuff done after a long day at work and the bolognese recipe sounds delicious! I like the multifunctionality of this appliance. So exciting to think about the many meal possibilities! Thank you for the honest post and wonderful meal plan. I’d love the opportunity to try one, the cost of one never fit my budget! This new pot is everything I’ve been dreaming of! Less mess and easy! Loving the recipes too! THIS busy mom Would Love to win! Trying to cut out processed foods. I would love try one of these as we are a busy family. Whoa, this looks awesome! So often healthy meals require so many steps and extra dishes to use, clean and put away—I love how this all-in-one machine can do it all! Fewer dirty dishes and a faster meal prep means more time to sit and enjoy dinner with my family. I would love to win this! I’m going back to school to finish my masters degree and with 3 kids and a husband this would help prep food for the week! This is great feedback- I definitely want to get this crock pot. 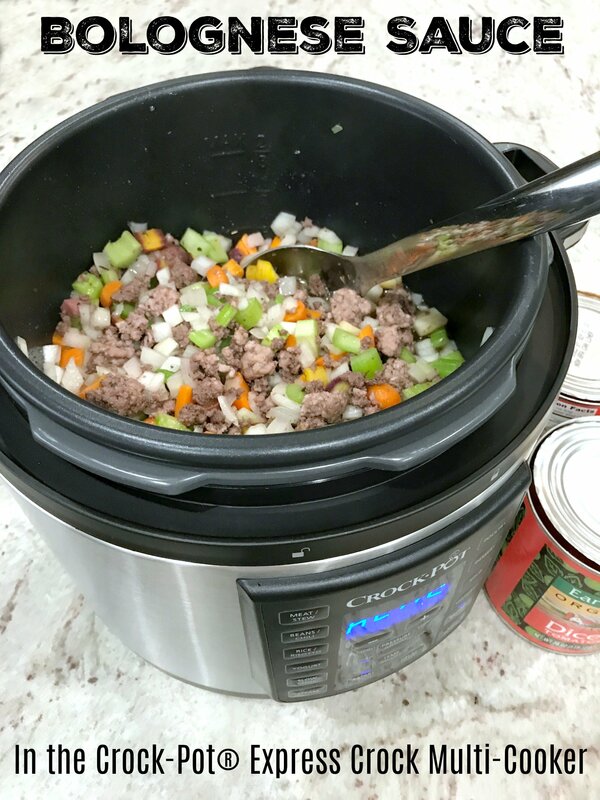 I have a delicious venison chili recipe that I want to try out with this crock pot. Would love this to make week nights simpler. I need a new Crockpot and have been curious about these multicookers! Would love to win this!!! I have been wanting to try a pressure cooker for it’s many benefits but have been intimidated by the use of it. This one sounds very easy to use! I work 2 full time jobs and a pressure cooker appliance would greatly help in making healthy meals in a timely fashion. I love my slow cooker, and the ability to sauté right in the pot and cook delicious meals in half the time would be wonderful! I have been wanting to get on the pressure cooker train but have heard so many mixed reviews! Glad this one has some great features! It seems like a slow cooker on steroids! I’d love to be able cut out the dirty pots and pans you need for pre-cooling many slow cooker recipes. I have been wanting to get a pressure cooker. I have been trying to compare the different brands. Santa didn’t bring me one so maybe I will be the lucky winner! I would like to try this new crock pot, am always hurrying after work to get dinner ready. I bought one of your cookbooks and purchased your kids lunchtime cookbooks as well. However with two teen age girls very busy in dance and school and my husband (sales rep)and I (special education teacher)working full time we haven’t found the time to dig in to the cookbooks. This pressure cooker would be a great jump start to trying your recipes and a healthier lifestyle for our whole family! Thanks for taking the time to share with us to help improve others eating in a realistic way! I would love to try this, I love my crock pot, but have been waiting to try out a pressure cooker as well. If it’s made by Crock-Pot then it’s well made! I would love this appliance to make my busy life simpler. I would love to try this in starting back with eating real food… I’m cutting out processed foods again (after 2 years of being bad and feeling horrible) in the new year. I’ve wanted a multi-cooker for so long. This one looks great! I’ve been thinking about a pressure cooker because I LOVE my Crock Pot, but during the work week I am out of the house for longer than the crock pot cook time. I’d be able to use the pressure cooker to prepare dinners during the week, and also prepare multiple meals during my days off (in preparation for the week). It would make eating real food much easier! I would like a multi cooker so I can pressure cook my meats and also to make stew. Very attractive appliance. I would love to have one sitting on my kitchen counter and start using it to cook all of my new recipes from 100 Days of Real Food. Looks like a great product to save space in a small kitchen by limiting appliances needed. I could give a slow cooker, rice maker and yogourt maker away and add a pressure cooker to my appliances! I’ve been debating which type of pressure cooker to get – this blog was helpful and persuasive, thanks! Wow! What an amazing food recipes site i ever come across and i just can’t wait to try it at home asap. So good! This recipe made a lot of food! This one is a crowd pleaser. My kids thought it was great! So if you wanted to do this in a regular crock pot, what would the instructions be? How long to cook? I can’t afford to buy another appliance but would love to make this. When it says red wine, what kind of red wine is good for cooking. I don’t really drink alcohol much, so I don’t know a lot about it, and I haven’t cooked with it before. I’d like to try! Hey girl. This looks amazing, but my family doesn’t eat pork… can I substitute for more ground beef or some ground turkey to make it a little leaner as well?